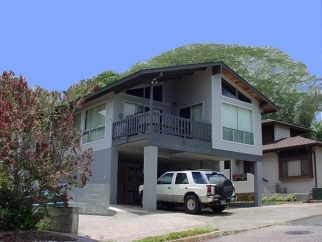 Located in the very desirable and rarely available, Northridge Subdivision at the top of Halawa Heights. Two bedrooms and a family room with wet bar are downstairs. The living area is upstairs with the other two bedrooms including the master. Natural wood cathedral ceilings in the kitchen, living and dining room, with ocean, mountain and harbor views. Large lanai, extra parking and room for a BBQ. Savings based on companies that charge a 6% list fee.